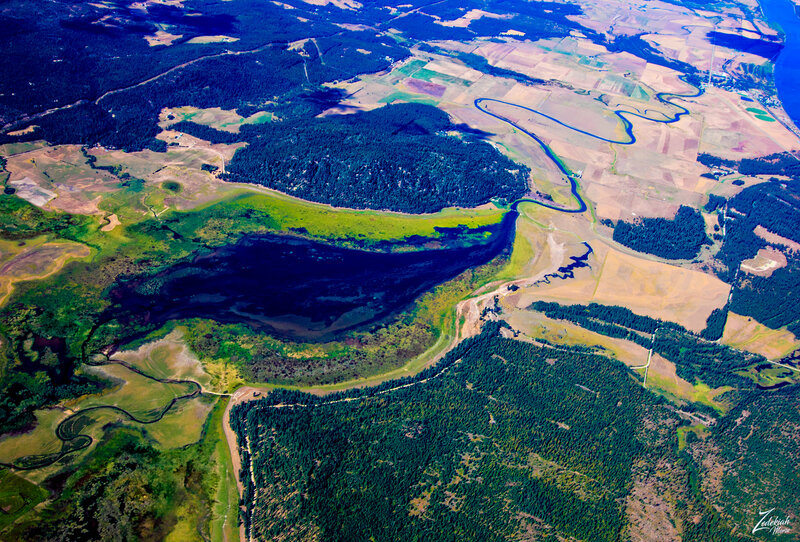 This image of Calispel Lake shows the Calispel River flowing out of the Pend Oreille River, (to the top right of the photo) and flowing south through the watershed wetlands, into the tiny lake and running out the south end of the lake. 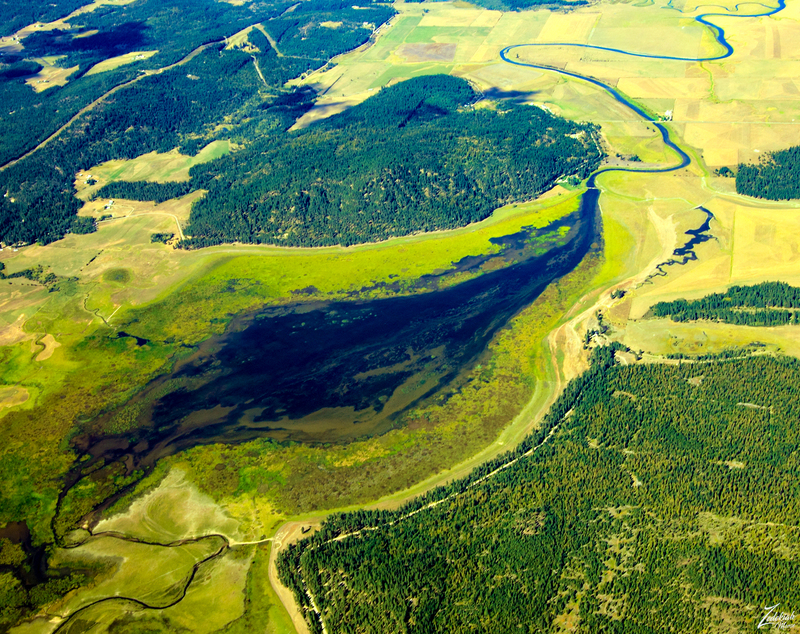 This vibrant, lush ambrosial green oasis is the tiny Calispell Lake located across the river from the also tiny First Nations “Pend d’Oreilles” (also known as the Kalispel) Reservation. An ancient North American Indigenous peoples of the Northwest Plateau, whose traditional ancestral territory was located around Lake Pend Oreille, as well as the Pend Oreille River, and Priest Lake. Today they live in small communities along the Montana and eastern Washington border. The primary ancestral tribal range was known by the name “Kaniksu” and covered roughly the area around the plains in eastern Montana, and westward along the Clark Fork River, Lake Pend Oreille in Idaho, and the Pend Oreille River in eastern Washington and also into British Columbia (Canada). Originally called “Ql̓ispé” ( the Salish pronunciation is [qəˀlispe], which means “Camas People”), French trappers and traders a few hundred years ago bestowed upon them the name “Pend d’Oreille” ( which meant “hangs from ears”) referring to the large shell earrings they commonly wore. The modern name “Kalispel” comes from an Anglicization of the name;“Ql̓ispé”. The main part of the Kalispel Reservation is northwest of Newport, Washington, in central Pend Oreille County. The main reservation area is a mere 18.638 square kilometers (7.196 sq mi) strip of land along the Pend Oreille River, west of the Washington–Idaho border.